Biological organisms are interrelated through the resources they share during their life cycles. 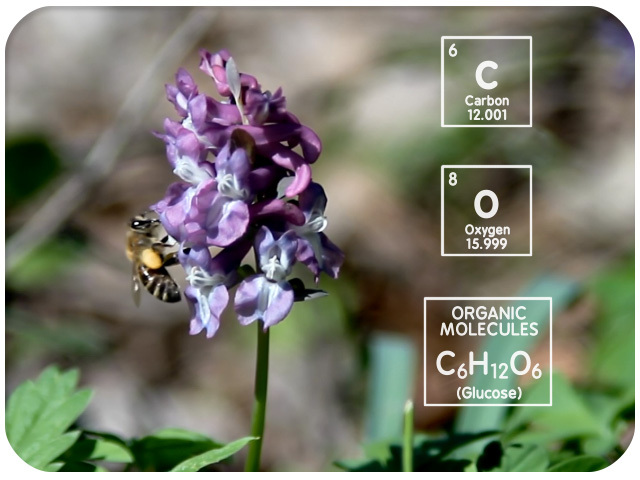 All biological organisms, like the flowering plant and honeybee you see here, are interrelated through the resources they exchange during their life cycles. These resources include carbon, oxygen, and organic molecules–all of which fuel the production of the energy molecules required for the many essential biochemical pathways that power biological growth and development. Here we will explore how these life cycles are connected. Plants use sunlight, water, and carbon dioxide to produce sugars and oxygen. 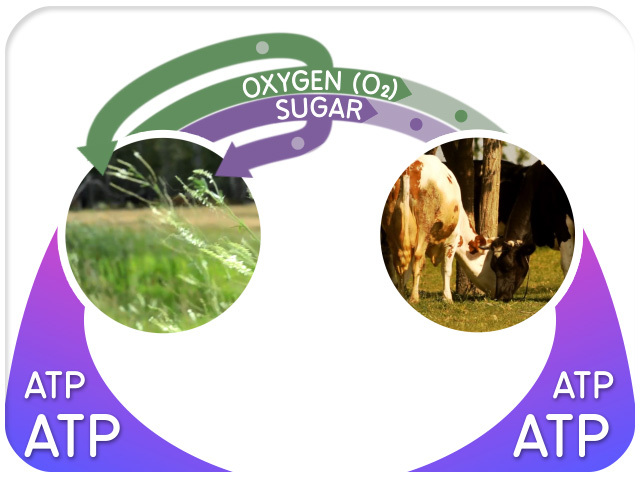 The oxygen is released into the atmosphere while the sugars are used by plants to make ATP. When an animal consumes a plant, sugars from the plant, and oxygen from the air, are converted to carbon dioxide and water. During this conversion, ATP is made. 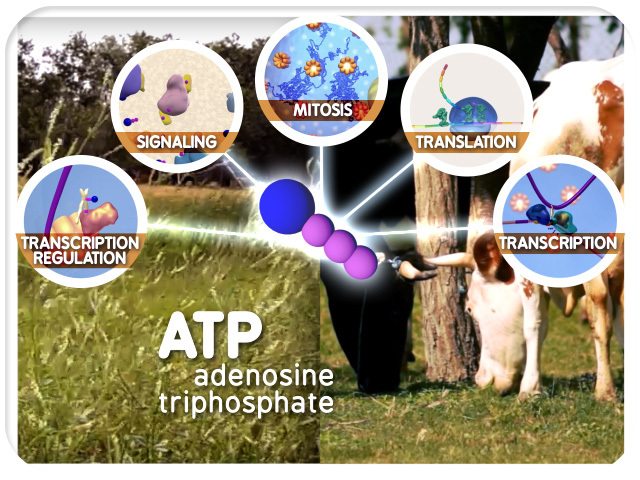 ATP is a critical energy molecule for both plants and animals; it drives many biochemical reactions within all organisms. The carbon dioxide that animals produce during aerobic respiration can then be used by plants during photosynthesis to make more sugars. Let’s look at this more specifically. 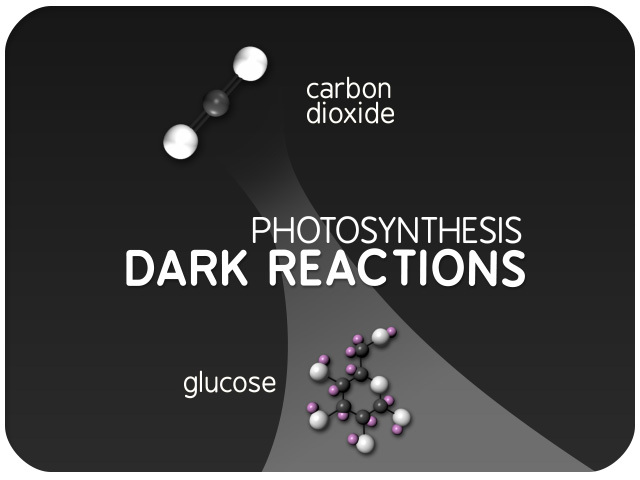 In photosynthesis, sunlight, carbon dioxide, and water are used by plants in the light and dark reactions to make oxygen and sugars. 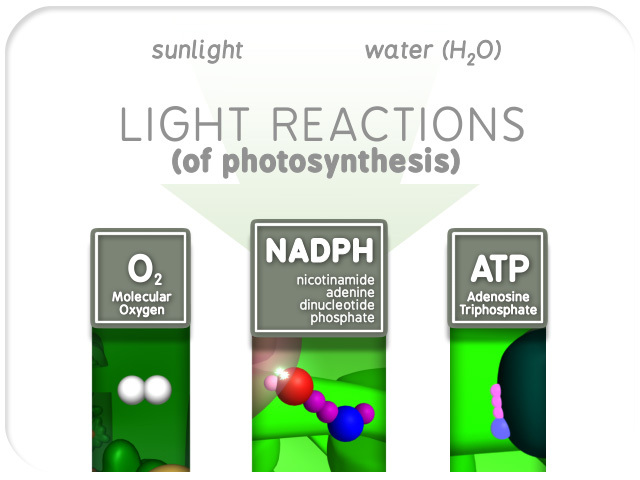 During the light reactions, sunlight and water are used to make molecular oxygen, ATP, and NADPH. The oxygen is a component of the air animals breathe. ATP and NADPH are important energy molecules. During the dark reaction, the ATP and NADPH made in the light reactions are used to fix carbon dioxide into sugars. The overall equation that represents the photosynthesis process is carbon dioxide + water →a simple sugar, such as glucose -6-phosphate + oxygen. The water molecules seen in this equation are consumed in the light reactions to yield oxygen. 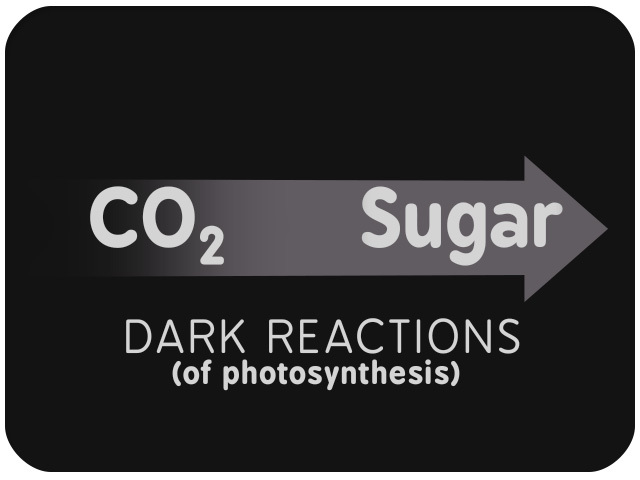 The carbon dioxide molecules are used in the dark reactions to yield sugar. Importantly, during the light reactions, light energy from the sun is converted into chemical energy in the form of ATP and NADPH. Equally important, the dark reactions incorporate carbon into organic molecules such as sugars. The sugar and oxygen molecules that plants produce during these reactions are available to the plant and animals alike for energy production. However, animals are equally important in this relationship. Plant material consumed by animals is converted into sugars, fats, and amino acids. 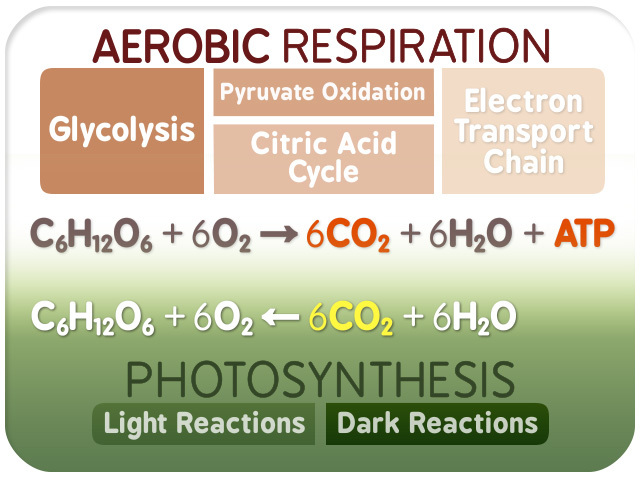 This conversion results in the production of energy and carbon dioxide through a process known as aerobic respiration. 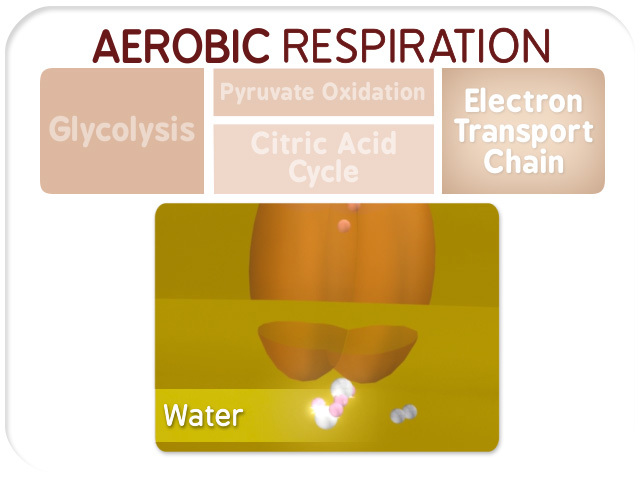 Aerobic respiration involves several stages that result in ATP production. 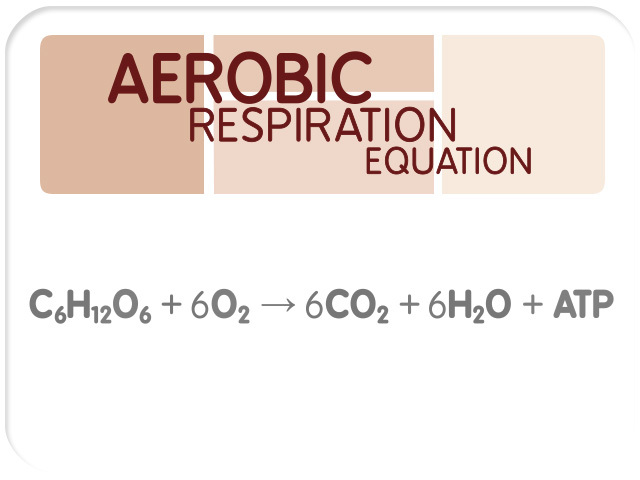 The general equation for aerobic respiration is: sugar + oxygen → carbon dioxide + water + ATP. Glycolysis is the first stage of aerobic respiration. During glycolysis, sugars are broken down, and ATP and pyruvate are produced. Glycolysis also generates critical electron carriers. Pyruvate is modified during pyruvate oxidation and the citric acid cycle to generate carbon dioxide. During these steps, more electron carriers and ATP are produced. The electrons from these carriers are passed through a series of complexes known as the electron transport chain. During the final step of electron transport, oxygen accepts electrons and protons to make water. A proton gradient is generated during electron transfer and water production. This gradient drives the production of additional ATP. The carbon dioxide that plants use to make sugars during photosynthesis comes from sugar breakdown during aerobic respiration. 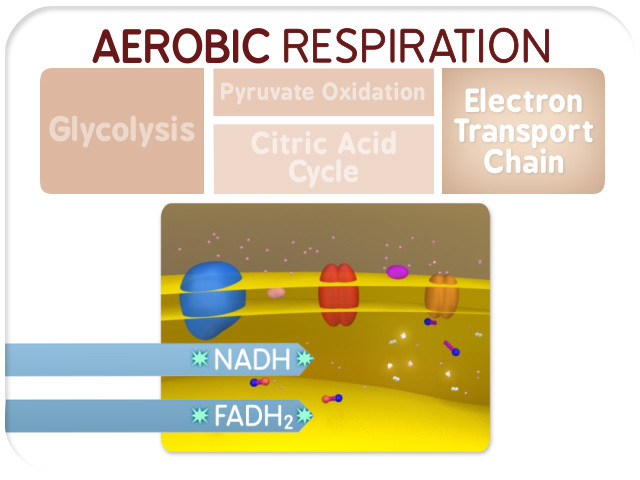 And the ATP generated through aerobic respiration is essential for many biochemical reactions of all cells. This general overview of the important connections between the plant and animal worlds, shows that biochemical reactions are part of an interrelated series of events crucial to the success of life on earth. Biological organisms are interrelated by the resources they exchange during their life cycles. 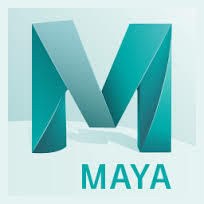 These resources include carbon, oxygen, and organic molecules such as glucose. The resources they exchange contribute to the production of energy molecules. ATP is an energy molecule that powers biological growth and development. 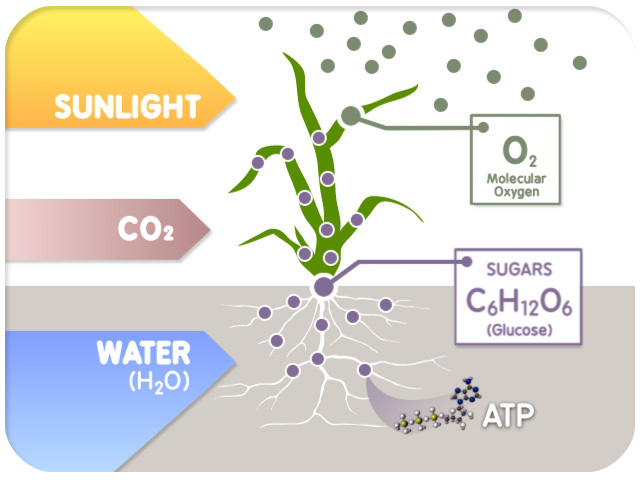 Plants use sunlight, water, and carbon dioxide to produce sugars and oxygen. 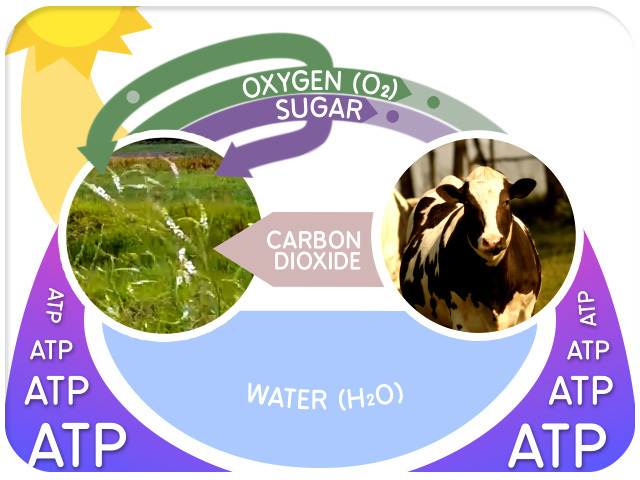 The oxygen is released into the atmosphere while the sugars are used by plants to make ATP. When an animal consumes a plant, sugars from the plant, and oxygen from the air, are converted to carbon dioxide and water. This conversion also results in the production of ATP. 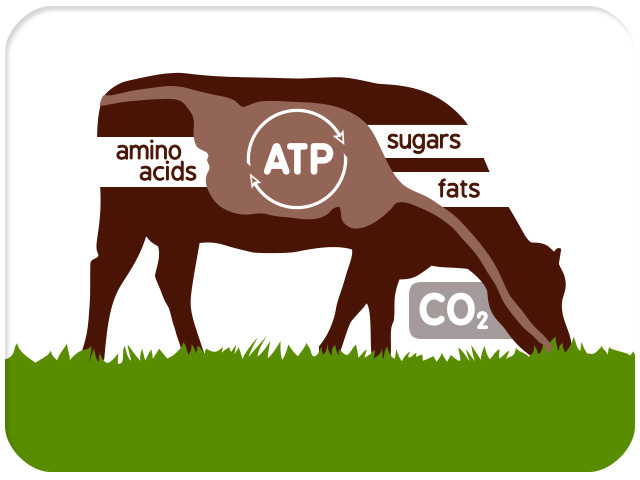 ATP is a critical energy molecule for both plants and animals. 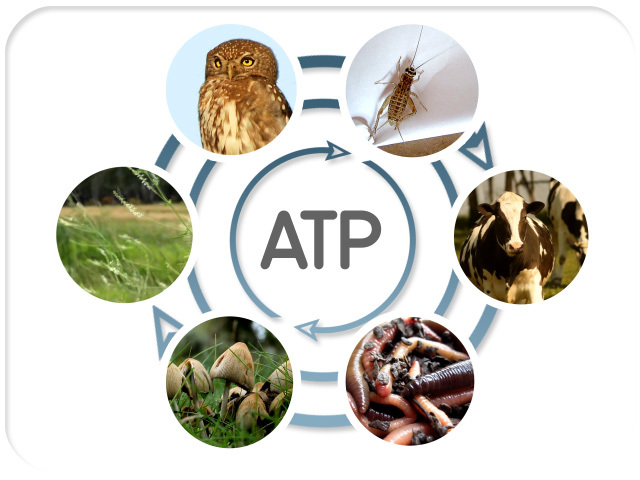 ATP drives many of the biochemical reactions within organisms. 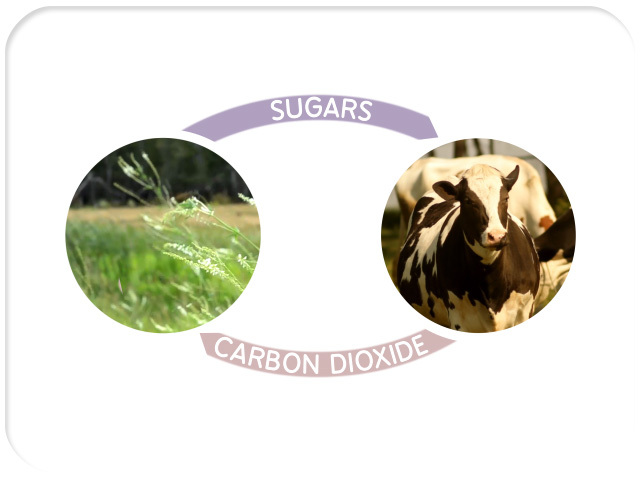 The carbon dioxide that animals produce can then be used by plants to make more sugars. 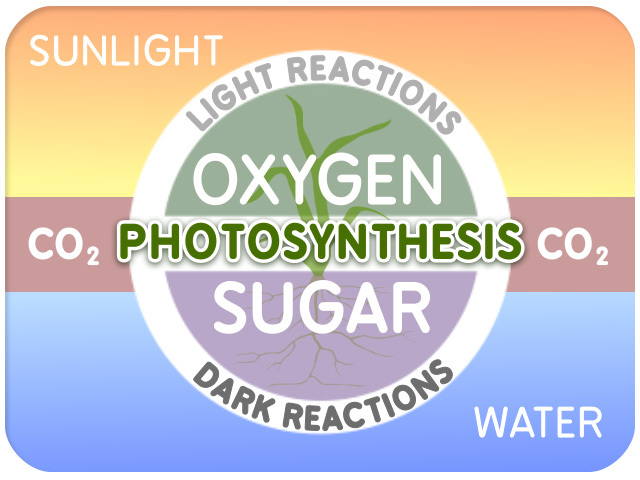 In photosynthesis, sunlight, carbon dioxide, and water are used by plants in the light and dark reactions to make oxygen and sugars. 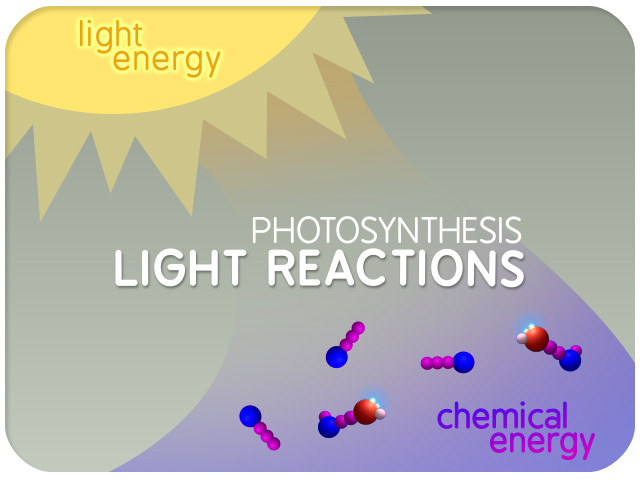 During the light reactions, sunlight and water are used to make molecular oxygen, ATP, and NADPH. The oxygen is a component of the air animals breathe. ATP and NADPH are important energy molecules. During the dark reaction, the ATP and NADPH made in the light reactions are used to fix carbon dioxide into sugars. 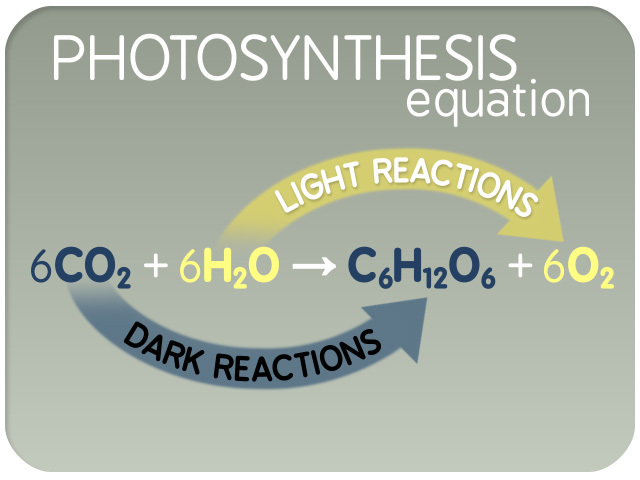 The photosynthesis equation is carbon dioxide plus water gives a simple sugar, such as glucose-6-phosphate, plus oxygen.The water molecules in this equation are consumed in the light reactions to yield oxygen. The carbon dioxide molecules are used in the dark reactions to yield sugar. The dark reactions incorporate carbon, from carbon dioxide, into organic molecules such as sugars like glucose. 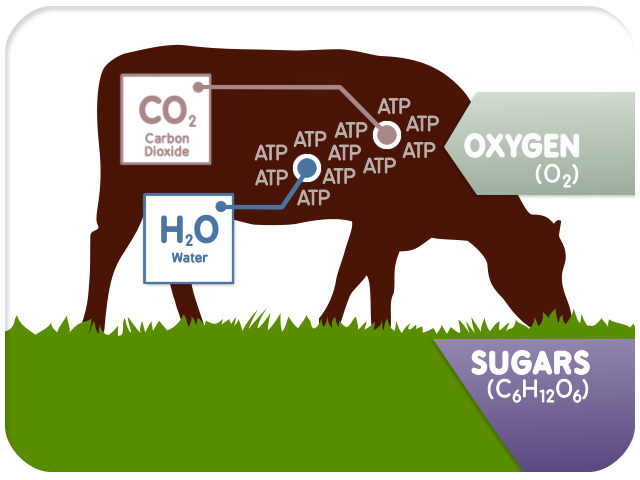 The sugar and oxygen molecules that plants produce during these reactions are available to both the plants and animals for energy production. Plant material consumed by animals is converted into sugars, fats, and amino acids. This conversion results in the production of energy and carbon dioxide through a process known as aerobic respiration. 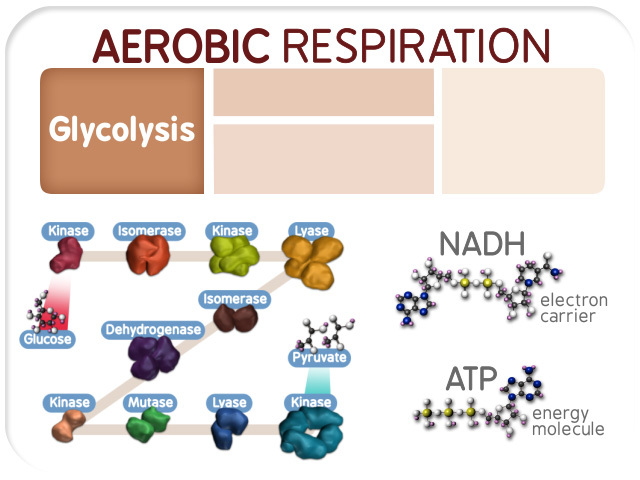 Aerobic respiration involves several stages that result in ATP production. The general equation for aerobic respiration is: sugar plus oxygen gives carbon dioxide plus water plus ATP. Glycolysis is the first stage of aerobic respiration. During glycolysis, sugars are broken down, and ATP and pyruvate are produced. Glycolysis also generates critical electron carriers such as NADH. 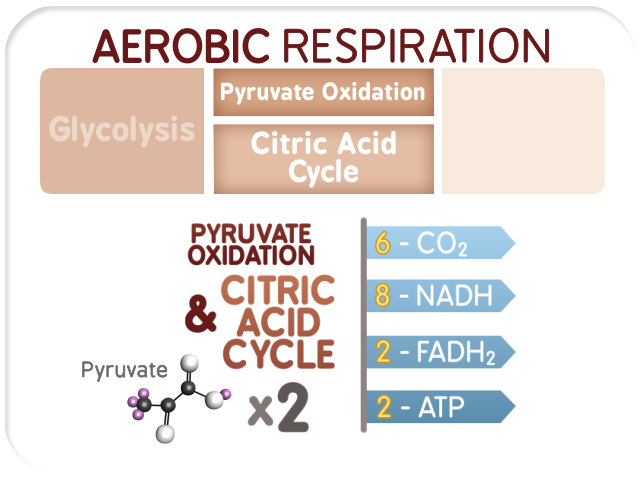 Pyruvate is modified during pyruvate oxidation and the citric acid cycle to generate carbon dioxide. These steps also produce more electron carriers (NADH and FADH2) and ATP. 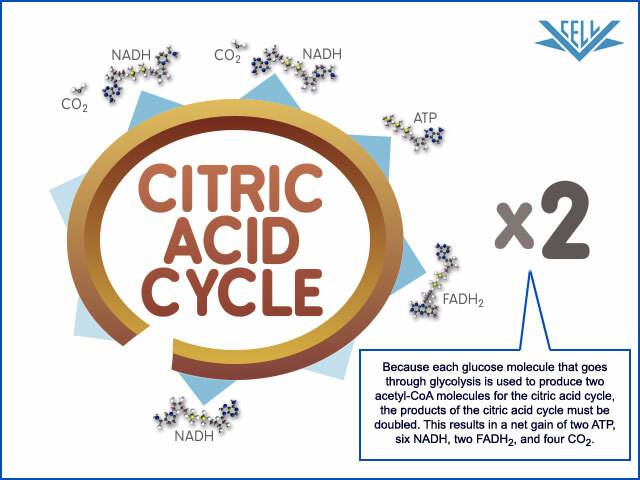 The electrons from the carriers created in the citric acid cycle are passed through a series of complexes known as the electron transport chain (ETC). A proton gradient is generated during electron transfer and water production. This gradient drives the production of additional ATP. The carbon dioxide that plants use to make sugars during photosynthesis comes from sugar breakdown during aerobic respiration. 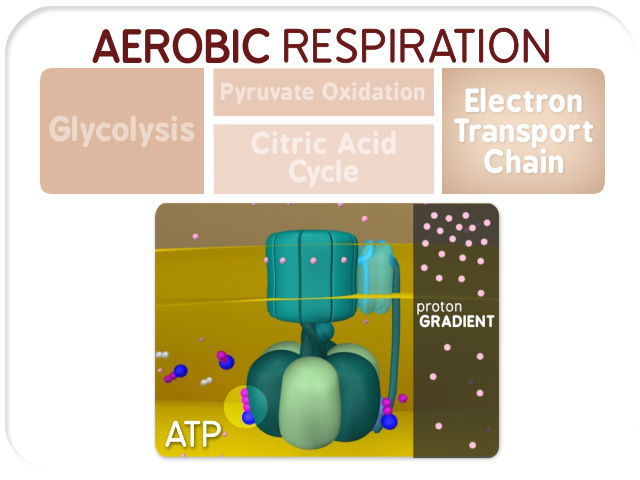 The ATP generated through aerobic respiration is essential for many biochemical reactions of all cells. The important connections between the plant and animal worlds show that biochemical reactions are part of an interrelated series of events crucial to the success of life on earth.